NJB Article and Source Repository: NOVA: Vikings Unearthed. Vikings Unearthed. Video. NOVA. PBS, April 4, 2016. Also here. 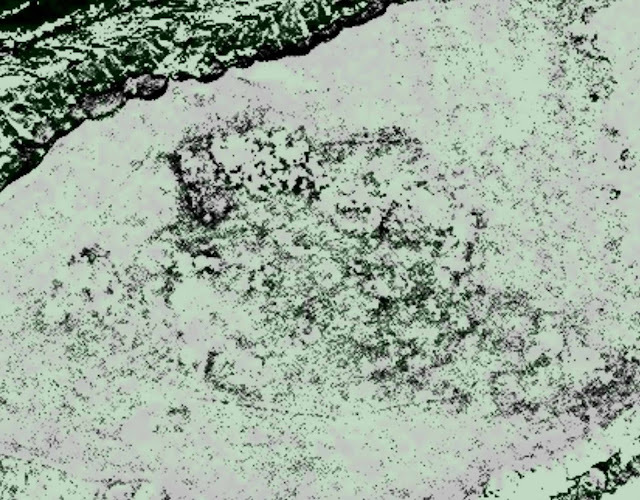 View From Space Hints at a New Viking Site in North America. By Ralph Blumenthal. New York Times, March 31, 2016. Possible Viking Settlement Discovered in Canada. By Tessa Berenson. Time, April 1, 2016. A thousand years after the Vikings braved the icy seas from Greenland to the New World in search of timber and plunder, satellite technology has found intriguing evidence of a long-elusive prize in archaeology — a second Norse settlement in North America, further south than ever known. 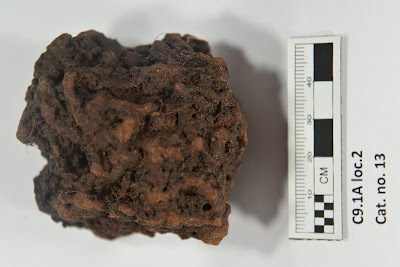 The new Canadian site, with telltale signs of iron-working, was discovered last summer after infrared images from 400 miles in space showed possible man-made shapes under discolored vegetation. The site is on the southwest coast of Newfoundland, about 300 miles south of L’Anse aux Meadows, the first and so far only confirmed Viking settlement in North America, discovered in 1960. Since then, archaeologists, following up clues in the histories known as the sagas, have been hunting for the holy grail of other Viking, or Norse, landmarks in the Americas that would have existed 500 years before Columbus, to no avail. 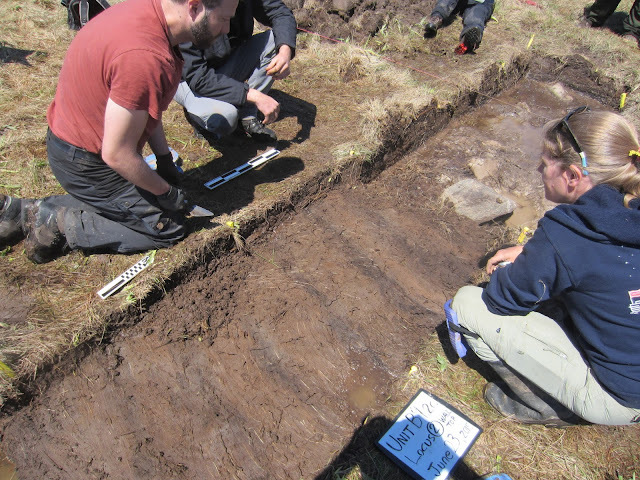 Douglas Bolender, left, and Sarah H. Parcak, right, looking for evidence of a Viking presence at a remote site, called Point Rosee by researchers, in Newfoundland. If confirmed, the site would be the second known Viking settlement in North America. Credit Greg Mumford. But last year, Sarah H. Parcak (pronounced PAR-kak), a leading space archaeologist working with Canadian experts and the science series NOVA for a two-hour television documentary, “Vikings Unearthed,” that will be aired on PBS next week, turned her eyes in the sky on coastlines from Baffin Island, west of Greenland, to Massachusetts. She found hundreds of potential “hot spots” that high-resolution aerial photography narrowed to a handful and then one particularly promising candidate — “a dark stain” with buried rectilinear features. of the region. Credit Greg Mumford. “It screams, ‘Please excavate me!,’ ” said Dr. Parcak, an associate professor of anthropology at the University of Alabama at Birmingham, who won the $1 million TED prize last year for her pioneering work using satellite images to expose the looting of ancient Egyptian antiquities and is using it to globally crowdsource new archaeological sites from space. The NOVA program will stream online at http://pbs.org/nova in the United States at 3:30 p.m. Monday, Eastern time, (along with a BBC program in England), and will be broadcast on PBS at 9 p.m. Wednesday. Given the dashed hopes of previous searches and the many spurious claims of Viking presence in the Americas, scientists on the project as well as outside experts have voiced caution. “Tremendous, if it’s really true,” said William Fitzhugh, director of the Arctic Studies Center and Curator in Anthropology at the Smithsonian’s National Museum of Natural History in Washington. “It wouldn’t be unexpected,” he said, but added that he wanted to see the data. “There’s no lock that it’s Norse, but there’s no alternative evidence,” said Douglas Bolender, a research assistant professor at the Andrew Fiske Memorial Center for Archeological Research and the Department of Anthropology at the University of Massachusetts, Boston, who joined the expedition. He said a buried structure there could be a smithy for longboat nails and weaponry, another strong indicator of Viking presence. “It would just be logical that there’s more than one site,” said Gerald F. Bigelow, a lecturer in history at Bates College in Lewiston, Me., and a specialist in archaeology of the North Atlantic. One of the satellite images used by Sarah H. Parcak to identify potential Viking settlement sites along North America’s Atlantic coast. Darker areas were seen as potential structures. Credit DigitalGlobe. Much depends on what else is found at the site. In archaeology, context is everything. A famous prehistoric site in Brooklin, Me., yielded an 11th century silver Norse coin but it is believed to have landed there through trade and not as proof of Viking settlement. Master shipbuilders and seafarers, warriors, traders and raiders, the Vikings boiled out of the Scandinavian fjords starting around the 8th century, marauding through Asia and the Middle East, North Africa and Europe. The Vikings focused particularly on the British Isles, and west to Iceland and Greenland, as memorialized in oral narratives and later recorded as the sagas by 13th-century Icelandic monks. Around 1000, Leif Ericson led an expedition to what became known as Vinland at the northernmost point of Newfoundland at L’Anse aux Meadows (the name an obscure corruption from the French) where explorers starting in 1960 discovered remnants of an extensive colony, including dwellings, a forge, and carpentry workshop — the Vikings’ first and so far only known landmark in the New World. They appear to have been routed by indigenous people the Norse called Skraeling. One intriguing find was the seeds of a butternut tree, which did not grow that far north and hinted of travels to milder climates in the Gulf of St. Lawrence. But evidence of other Viking settlements has been lacking. Dr. Parcak began her research by using a commercial satellite called WorldView-3, belonging to the company DigitalGlobe, to search known Norse sites on minuscule Papa Stour in the Shetland Islands of Scotland. Using the near-infrared spectrum invisible to the human eye, the satellite detected buried walls, and digging yielded a carnelian bead from India similar to those found at other Viking sites. Dr. Parcak then focused her satellite search on thousands of miles of coastline from the Canadian Arctic to New England. After two weeks of digging at Point Rosee, an unexpected find in a flooded trench excited the explorers — several seeds, or perhaps blueberries, which were hurriedly sent for testing. The dates came back wildly off — 700 years after the Vikings, maybe even contemporary. They seem to have migrated onto the site much later. “You feeling nervous, Sarah?” a NOVA reporter asked Dr. Parcak.